"While in Calcutta I was given an opportunity to take a much earlier flight to Dinjan by a C-47 pilot that was going to continue on to Kunming. Thinking I could convince the pilot to deliver me closer to where I was going, I was just about to board his plane when I was stopped by a Charles Laughton looking man in a deeply rumpled civilian suit. 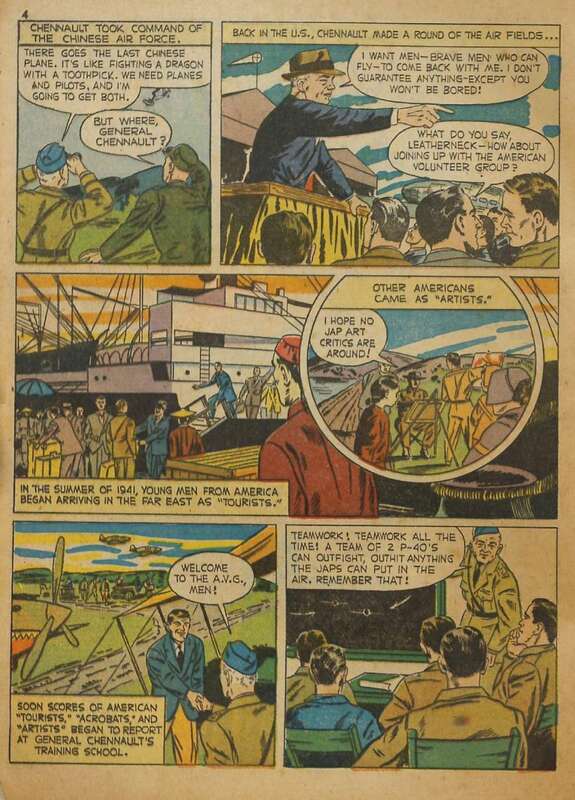 Robert Scott's story is one of the classic tales of World War II. He had always wanted to be a fighter pilot, but when war came along he was told he was too old. He was training other pilots when he heard that some B-17 Flying Fortresses were being sent on a secret mission to the Far East. 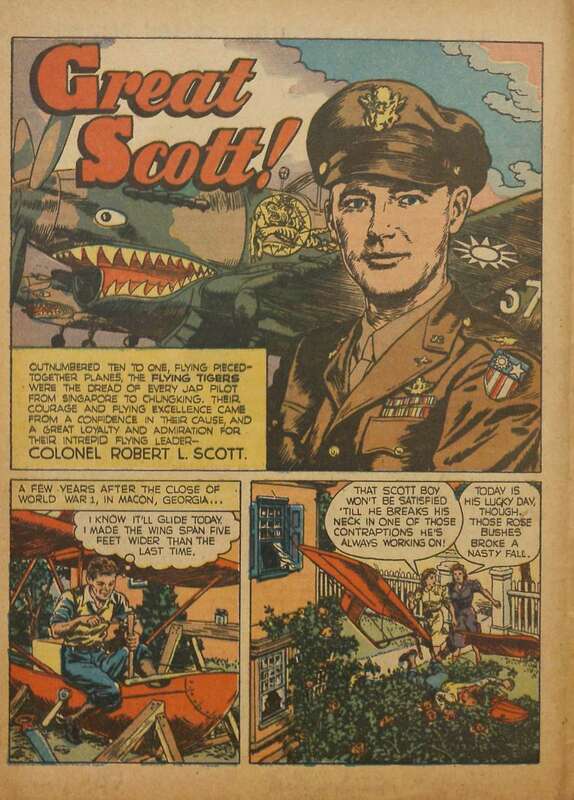 Scott volunteered, though he had never flown a B-17. He was sure the Fortresses would take him close to Chennault. Besides all of the kudos and successes granted and earned in the military and his documented and proven skill as a fighter pilot, Scott was also a prolific and well received author of close to a dozen books. His first book, God Is My Co-Pilot, a biography, was written in 1943 while still in the heat of war. It was not only a best seller, but also made into a highly successful motion picture of the same name. His second book, Damned to Glory is filled with chapter after chapter circulating around various experiences and stories of others, almost all of them having to do with P-40s in some fashion. 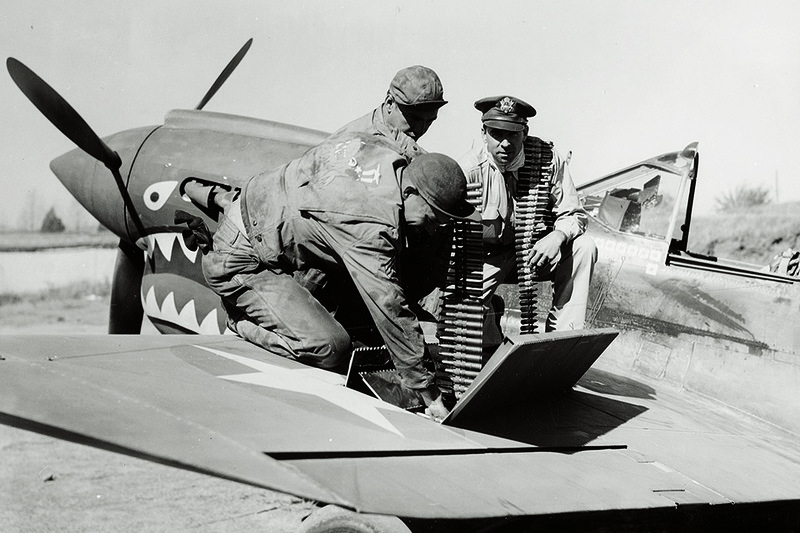 The original aircraft-based military unit that was formed and eventually became known as the Flying Tigers stemmed from an organization called the American Volunteer Group, or the A.V.G., given the name "Flying Tigers" basically by and through the press somewhat after the fact. The A.V.G. 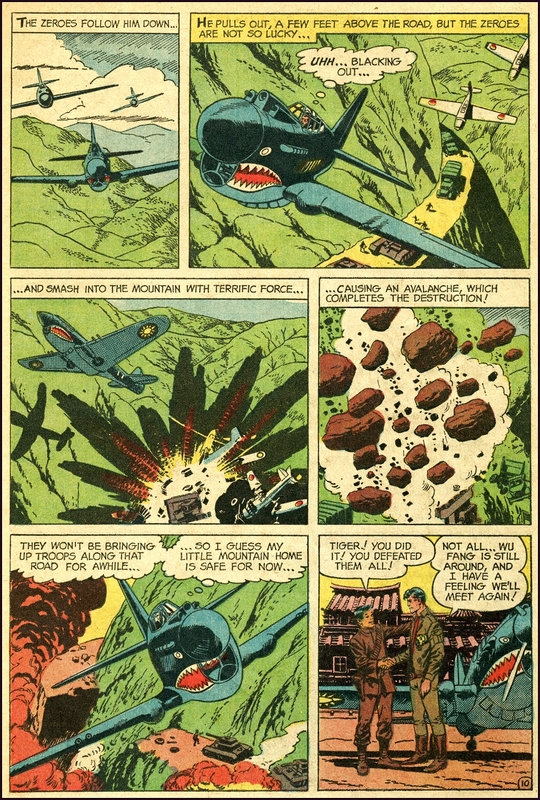 wasn't an American military machine at all, but actually part of Chiang Kai-shek's Nationalist Chinese Air Force, put into place to counteract the Japanese invasion of China after the Japanese had all but decimated the Chinese Air Force. American air-veteran Gen. Claire L. Chennault was hand-picked by Chiang Kai-shek to reconstitute what was left of his air force. To do so Chennault needed pilots and planes to intercept and stop the Japanese heavy bombers that were devastating the whole of the country as well as eliminate their fighter escorts. Chennault was able to put his hands on nearly 100 brand new Curtiss Wright P-40s said to still be in crates redirected to China that had been designated for use by some other country and some other purpose. The thing is, once he had the planes he didn't have anybody capable or able to fly them. A program was designed and put into place to hire experienced and trained American pilots, preferably on current active military duty, ensuring a certain already established set of standards in quality as well as falling within a certain age-group bracket and being physically fit. It was arranged so Army Air Force, Navy and Marine pilots could resign their commissions and after being hired by their employer of record, the Central Aircraft Manufacturing Company (CAMCO), a company that was initially established to teach the Chinese how to build airplanes, become members of the A.V.G. So too, when their contract was over they could return to their previous military positions without any adverse affect on their rank or stature. 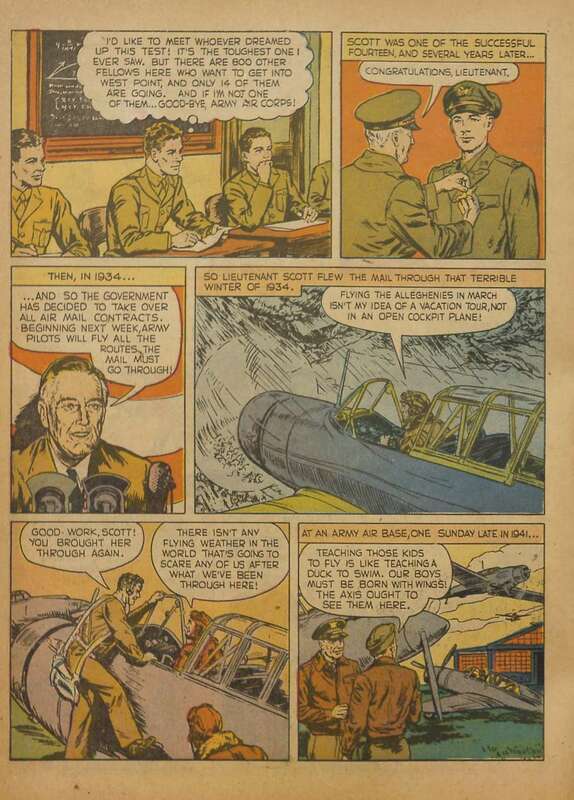 So said, we now come back to Robert L. Scott, Jr. and how, where, and if, when it came to the Flying Tigers, he fit in. Scott was a fully accredited commissioned officer in the United States Army Air Force with the rank of Colonel. Never under any circumstance did he resign his commission to work for or be hired by CAMCO, hence he NEVER was nor could he have ever been, a signed on the bottom line contract member of the A.V.G. Most historians and aficionados of the Flying Tigers agree if such was the case with anybody, they would not be considered to be or have been a Flying Tiger. Some, mostly Scott supporters, say all of that is nit picking. His record speaks for itself. Looking at it a little closer, if you remember from the above Chennault "gave" Scott a P-40 to protect the transport planes flying over "The Hump." 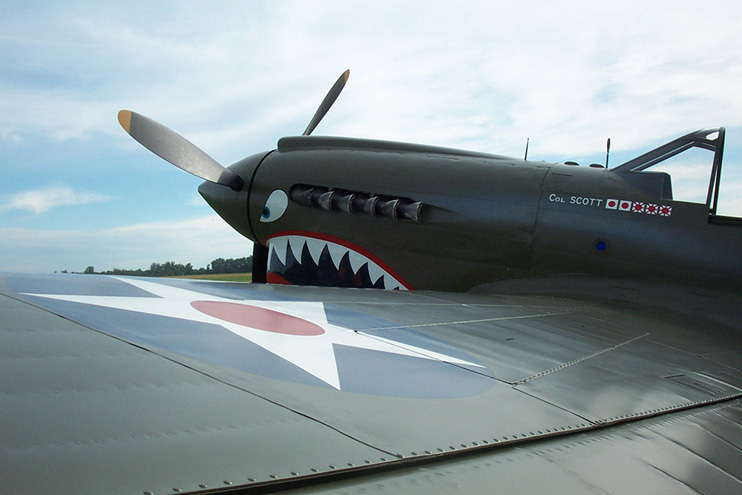 He in turn painted his own Flying Tiger shark teeth on the P-40 loaned him, making it in effect, at least in looks, a Flying Tiger. On his own, that is without assist by the A.V.G., he began a one-man war against the Japanese on the Burma Road. He also, when he could, flew combat missions as a wing man with the Flying Tigers, with none of those flying activities or others being an ordained member of the A.V.G. He did, however, or so it would appear, readily receive fuel, ammunition, maintenance, food, housing, and logistics without hindrance from the A.V.G., indicating a strong proprietary interest by them and what he did. In the end, not giving up his commission and sticking around paid off really well for Scott. As a fully accredited member of the United States Army Air Force --- while any and all members of the A.V.G. were not --- he was, especially so as a Colonel, in the right place at the right time to be appointed by Chennault to head up the Air Force replacement for the Flying Tigers. That replacement group took on the look and all the trappings of the Flying Tigers, but was NOT the Flying Tigers. Matter of fact only about five of the original members of the A.V.G. stayed on with the new group. 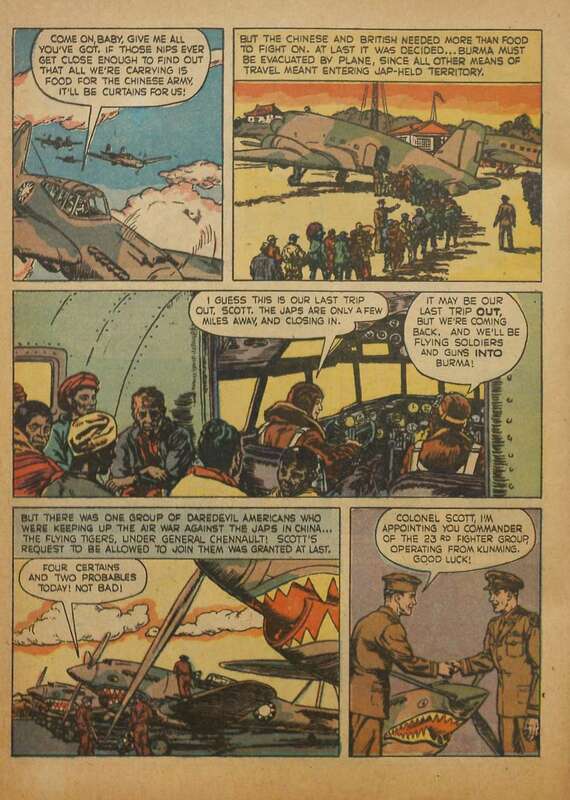 If you notice in the opening graphic at the top of the page it depicts Scott with a couple of crewmen loading ammunition into his P-40 of which the wing is clearly marked with a USAAF insignia. It isn't likely that Scott in the role of "wingman" on missions with the A.V.G. or on his own rogue runs against the Burma Road would have used an aircraft marked such that it could be identified as being an American fighter flown by an American aviator. 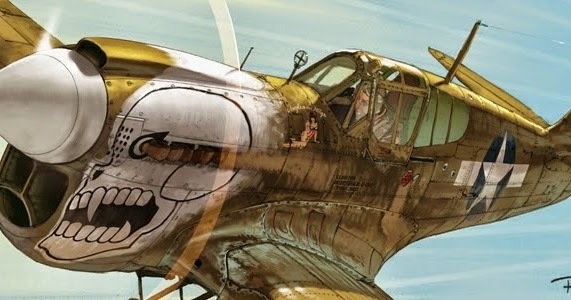 The illustrated story shows a P-40, presumed to be Scott's, as having Nationalist Chinese markings on the wings and fuselage. Either way it was fairly obvious to all parties involved what was going on. After all, the previous illustrated page just above showing Chennault recruiting acrobats and artists for the A.V.G. was published in November 1942. It would have been pretty easy for any Japanese spy worth his salt or soy sauce to have run into Tojo's office with a rolled up copy of the comic book and shown him what was going on. Any of you who have read my works on the Flying Tigers know I speak fairly highly of Olga Greenlaw who had been with the Flying Tigers from day one. Olga, whose husband was second in command of the Flying Tigers under Chennault, wrote a book titled Lady and the Tigers that was published in 1943 right after the Tigers were disbanded but with the war still raging. A couple of years after the war had ended, while I was still a young boy, the woman who was to become my Stepmother, and personally knew Olga Greenlaw, gave me a copy of the book of which I read over-and-over almost to a point that in regards to the Flying Tigers it was like a bible to me. Olga, never one to mince words, makes mention of Robert L. Scott in her book on several occasions and, even though when it came to the Flying Tigers I always personally thought of him as sort of a carpetbagger, nowhere does she say anything unflattering about him. My take away is that even though he wasn't a Flying Tiger in the classical sense, i.e., an avowed signed-contract resigned his commission member of the A.V.G., it didn't seem to matter much to her or the rest of the unit. If it did, it either didn't come to her attention or if it did she didn't think it was worth writing about. Scott was born in 1908 making him 10 years old just at the end of World War I. Airplanes had come into their own being during the war and him being eight years old or so when the U.S. entered the fracas on a formal basis he had a full two years of boyhood input of airplanes becoming dominant in warfare. After the war the whole countryside was filled with out of work pilots barnstorming all over the place. The prefect environment for a young boy to be bitten by the "flying bug." 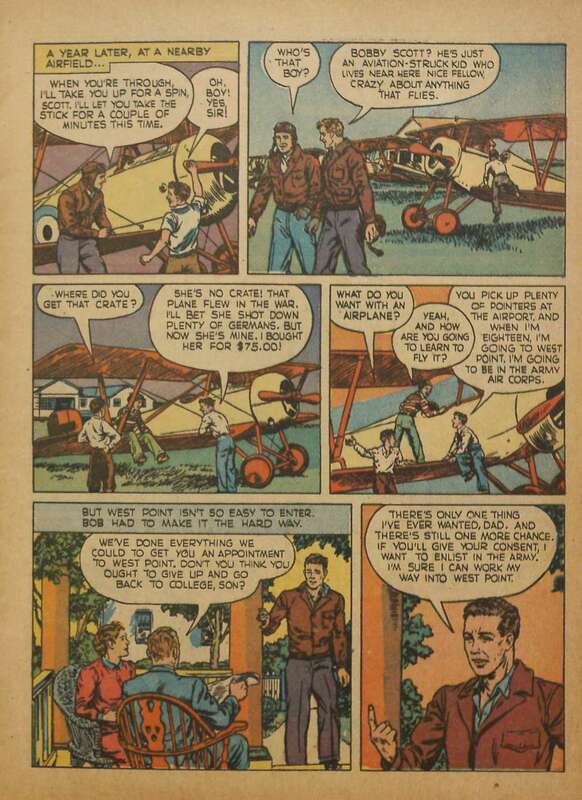 If you look at the two bottom panels of the first page of the illustrated story above you will see where the young Scott, a few years after the close of World War I, in Macon, Georgia is thinking to himself after having designed and built what appears to be a rather way to elaborate glider-like flying craft, "I know it'll glide today. I made the wing span five feet wider the the last time." In the opening chapter of his book "God Is My Co-Pilot" Scott writes that he and two friends pull the craft to the top of the roof of a high colonial house and running down the sloped roof with his friends holding the wing tips, flew out into space. Then he writes the wings buckled in the center, crashing sixty-seven feet to the ground --- which would infer a pretty high colonial house. The last panel of the first page shows Scott in his wrecked machine in the bushes with two women onlookers talking to each other with one saying, "That Scott boy won't be satisfied 'till he breaks his neck in one of those contraptions he's always working on!" The other responds with, "Today is his lucky day, though. Those rose bushes broke a nasty fall." A couple of things are apparent, although not sure how much of it is artist privilege. The conversation between the two women indicates that the attempt so illustrated wasn't his first as does his "thoughts" about having increased the wing span five feet. The second thing is the closeness of the crashed craft to the house. If he was sixty-seven feet high he must have went straight down. Not much of a glide. In my works I write fairly extensively about the flying machine I built with the help of my Uncle when I was around Scott's same age. 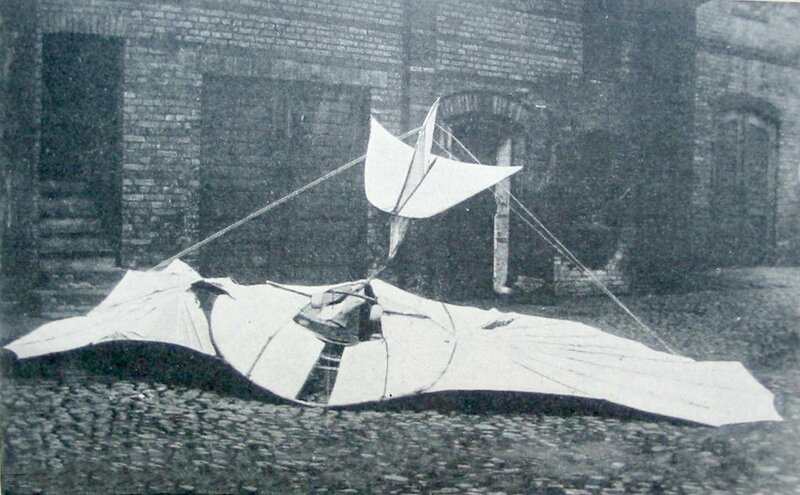 It was originally based on a Leonardo Da Vinci design, but after a few attempts, we switched over to a craft more closely resembling a Lilienthal Glider Type IX. The quote directly below is about my flight. The quote directly below the graphics is how Scott summed up his flight in an interview as found in the source so cited. "It was only a short time after returning from the desert during the summer of 1948 and just before school started at around age 10 or so, that I removed the flying machine my uncle and I built from the hanging position of it's construction lair and hauled it up to the rooftop of the second story building across the street. Then, holding onto the machine for dear life, I jumped off. "The craft maintained the same two-story height advantage for quite some distance, but partway into the flight, instead of continuing in the direction I wanted, it began tipping lower on the right and turning. Without ailerons or maneuverable rudder controls and with inexperienced over-correcting on my part creating an adverse yaw followed by a sudden stall, the ensuing results ended with a somewhat dramatic drop, crashing into the porch and partway through the front windows of the house diagonally across the way." Scott was big in other ways too. On the day I met the woman who would become my stepmother for the first time and she saw my avid interest in "The Lady and the Tigers" that I had removed from the shelves in her library, she loaned me her own personal signed copy as I was leaving. She also gave me a second book that dealt with P-40s titled Damned to Glory which was written by Scott. 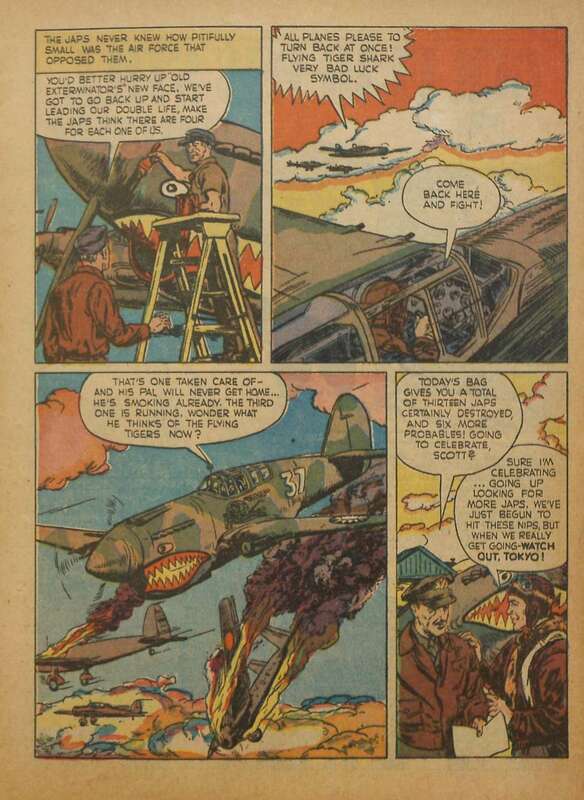 I know I don't say a lot about Damned to Glory throughout most of my works, always it seems going on-and-on about The Lady and the Tigers, but that's because most of what I write about when it comes to P-40s has to do with the Flying Tigers. Usually when I mention Scott's Damned to Glory it is in conjunction with what is typically referred to as the P-40 Ghost Ship linked below. Where The Lady and the Tigers was almost like a bible, easily blanketing a much wider area for me regarding Flying Tigers and P-40s, Damned to Glory fulfilled a much more specific role --- a role that relentlessly kept coming back over-and-over throughout the years to haunt me until one day what happened in the book happened to me. Or at least what happened in the first chapter of the book titled "Ghost Pilot," came to haunt me, the rest of the chapters falling by the wayside, never reaching the same status, even becoming, relative to me, inconsequential in the overall scheme of things. So said, such was not the case with Chapter One. Although there wasn't an actual straight line replication of events as those found in "Ghost Pilot" there was a straight line path of those events that led directly to me. 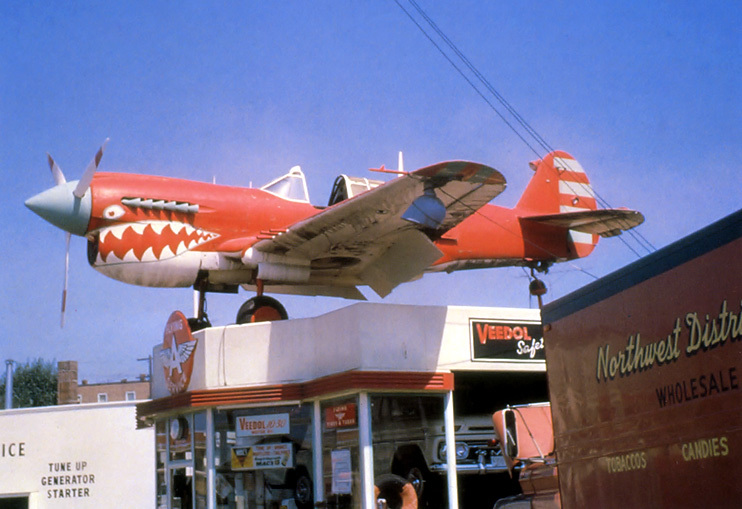 "When he wasn't escorting the transports, the P-40 was his to do with as he pleased. 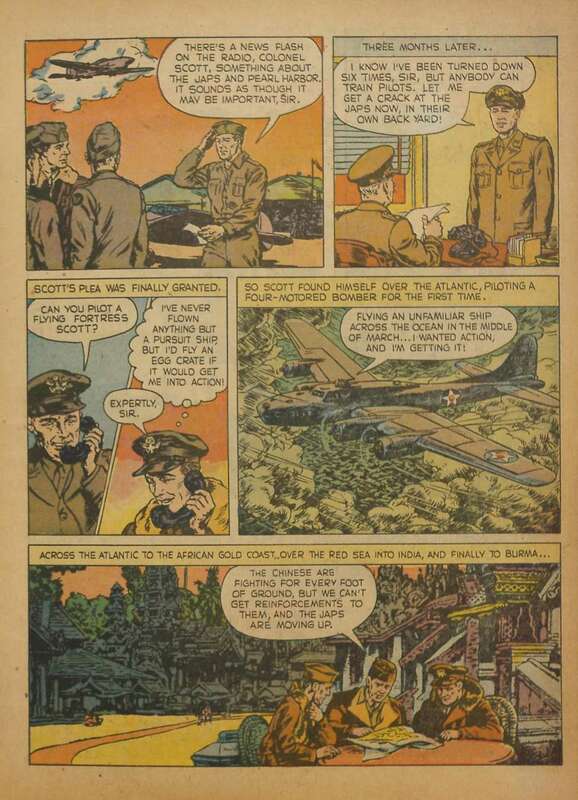 On his own, Scott began a one-man war against the Japanese on the Burma Road. He even had the propeller spinner on his Tomahawk, which he named 'Old Exterminator,' painted a different color each day so the Japanese would think that a whole squadron of planes was strafing them. 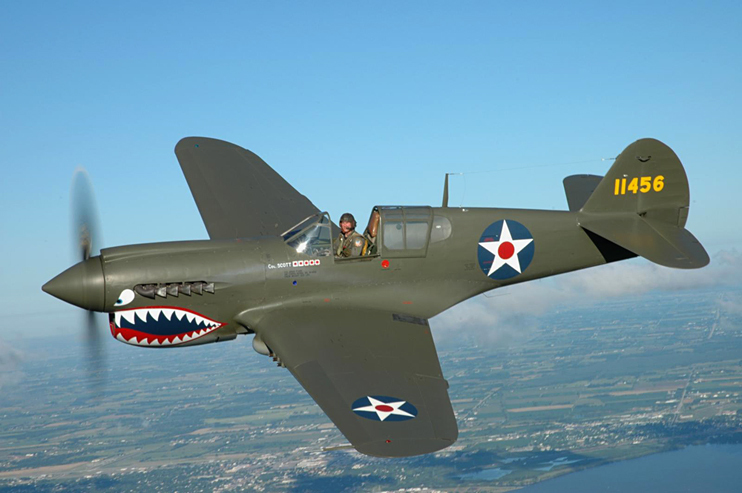 On some days he flew as many as five missions"
"After extensive research that included trips to the Smithsonian Institution to study eight reels of microfilm of the P-40's original drawings, the gathering of needed parts from locations as diverse as Alaska and New Zealand and a financial investment that went 'well into six figures,' Hansen has resurrected his P-40 to match the first Flying Tiger Col. Robert Scott flew in the war. "It was around dusk of the last Friday in May, 1944. The CNAC C-47 slowly moved across the tarmac eventually lifting up out of Calcutta bound for Dinjan. 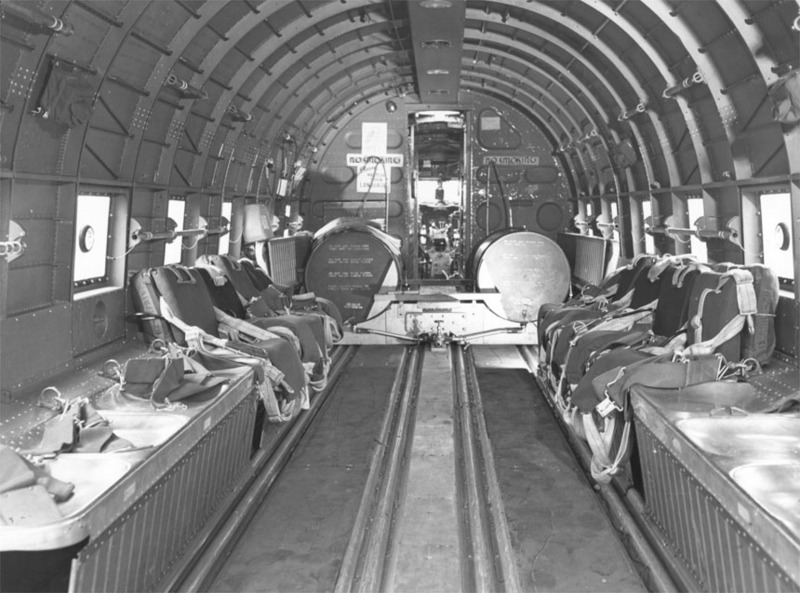 "With the extremely bad weather and strong tailwind we encountered almost immediately as well as being double hammered by static so bad the pilot couldn't get a fix on any radio station, the plane passed well east of Dinjan, slamming headlong into an unnamed 22,000-foot high Tibetan mountain in the Graveyard of the Himalayas, otherwise known as the Aluminum Trail. "Some time later found me all alone in strong blizzard-like conditions face down partly covered by snow in a snow drift. 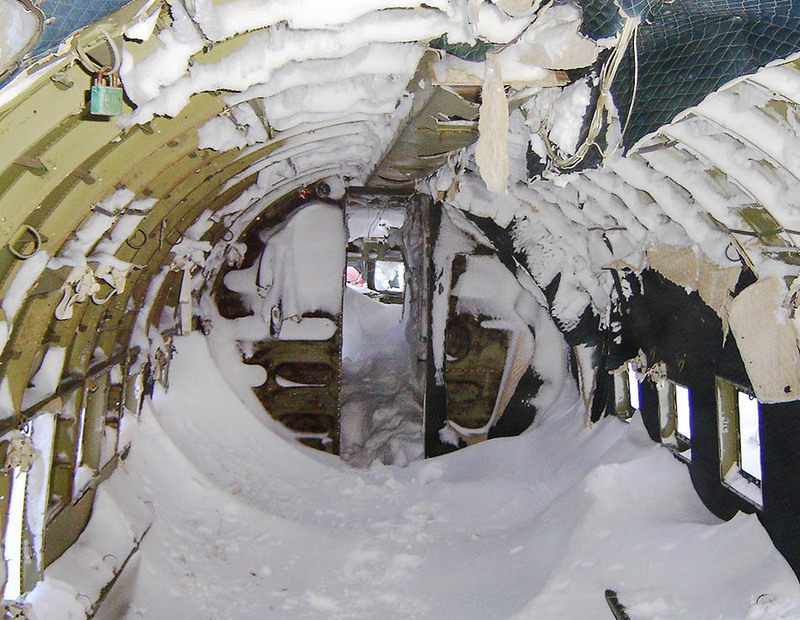 Wincing my eyes through frost covered eyebrows the best I could in the blowing snow I was barely able to make out what looked like the darkened remains of a fuselage. Inching my way across the drifts, the wind blowing so strong at times I couldn't remain upright. Facing white-out conditions as well, causing a complete loss of sense of direction, I finally reached the wreckage, using for all intent what was left of the interior of the fuselage as a wind break and shelter. Once inside I slowly began to regain my thoughts and clarity of mind. On my way to the wreckage I saw no signs of anybody else, nor inside the nearly intact portion I was in either. I scraped around and found a thermos full of, at least relative to me, lukewarm coffee and settled back trying to figure out just how long it would be before I froze to death."